CCleaner 4.16.4763 download software for Windows Xp, Vista, Windows 7 and 8. 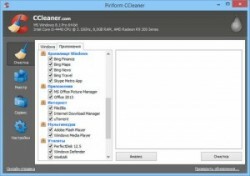 CCleaner is the very good tool for cleaning your Windows PC. It protects your privacy online and makes your computer faster and more secure. Temporary files, history, cookies, download history, Autocomplete form history, index.dat. Improved Google Chrome 36 cleaning and start-up management. Improved Firefox browsing cache cleaning. Added Repair option to Uninstall tool. Improved 64-bit build architecture on Windows 7 and 8. Added Teamviewer, Microsoft One Drive, Real VNC 5, Tag & Rename and Tango cleaning.